EMMETT, Kan. - Feb. 19, 2014 - PRLog -- "Only a dog with the best start will reach the top,” explains Margie Riccomini of Monarch Kennel. For the past 25 years, Margie has successfully bred, raised and sold Cavalier King Charles Spaniels and Papillons. Monarch's adults are vet checked annually for any potential health problems. Her puppies are kept current on all vaccines and wormings, along with health checks. Monarch Kennel is really a one of a kind kennel. Margie Riccomini offers nothing but the best puppies for her clients. All puppies are AKC and bred from award winning dogs. Margie’s dogs have competed and even ranked top 10 in AKC competitions. 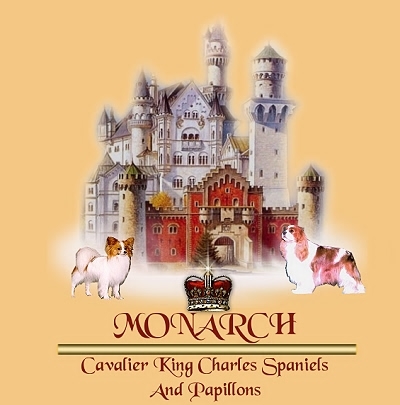 Margie Riccomini has been breeding Pappillons and Cavalier King Spaniels for the past 25 years. Her breeds have appeared on the front page of many magazines like the Top Notch Toy Magazine and even Animal Planet. Not only does Margie Riccomini use award winning dogs when breeding, she is proud of the fact that she properly socialized all of her puppies. Margie strongly believes that healthy dogs come from happy backgrounds. That is why she takes the time to properly care for each and every pup she raises. Now, you may wonder if her children will be able to show each and every puppy adequate amount of attention. Don’t worry, Margie Riccomini has 15 children. With 11 sons and 4 daughters, Margie has more than enough help showing the home bred pups the tender loving care they need to become great companions. Margie Riccomini is very proud of her and Monarch Kennel’s accomphisments. Besides raising amazing puppies, she is proud of her children and her faith in God. She explained that her mother is who influenced her to seek a strong relationship in her faith. Because she has strong ties to her church, Margie frequently volunteers her free time at the Manor where she spends her time keeping senior citizens company. After spending time with senior citizens, she learned how important it is to interact and socialize the puppies she breeds. These are many of the reasons why Monarch Kennel is so successful and why many of her new owners are repeat customers. Clients are very pleased with how obedient, loving and social their new companions are. If you are looking for a Cavalier King Charles Spaniel or Papillon that is properly socialized, happy and healthy or would like to learn more about Margie Riccomini, please visit monarchkennel.com for more information.